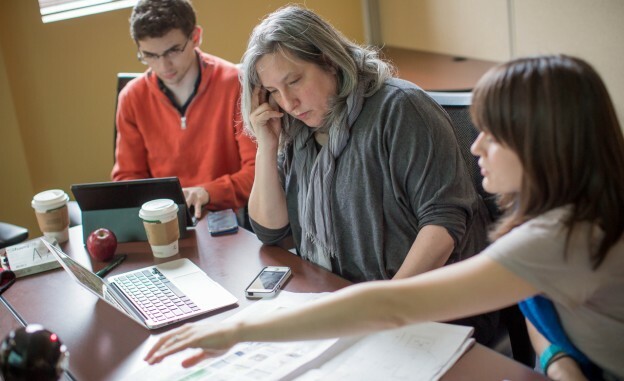 WVU student Tim Saar, Innovator-in-Residence Sarah Slobin (center) and documentary producer Elaine McMillion Sheldon discuss “The Drug Next Door” mobile-first reporting project. Photo by David Smith. 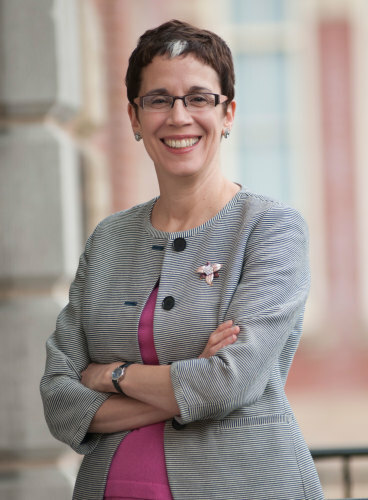 When West Virginia University’s Reed College of Media wanted to incorporate innovative professionals in its curriculum, Dean Maryanne Reed decided to test a virtual approach. Each semester, a visiting professional leads a class focused on emerging skills but comes to campus only a handful of times. Working with a faculty member who serves students in person and a series of digital resources, these Innovators in Residence take what they’re learning in the newsroom straight to students in the classroom. I talked with Reed about the program and her hopes for improving journalism education. Can you give us a brief overview of the Innovator-in-Residence Program at West Virginia University? Maryanne Reed: Since piloting our Innovator-in-Residence program in Spring 2014, we have hosted two innovators — Sarah Slobin, senior graphics editor at the Wall Street Journal, and Derek Willis, an interactive developer and data journalist from the New York Times. We were initially trying to hire an on-site innovator, someone who would move to Morgantown to work with students on projects and help us innovate curriculum. But we found it challenging to find people willing to step out of industry for any length of time because their skill sets are in high demand. They’re not people who have been-there-done-that, but people who are doing it right now. It’s also a hard sell to get someone to move to a college town in West Virginia, coming from a major market like New York City or the Bay Area. So one of our brilliant faculty members asked, ‘Why can’t we do this using distance technology and hire “virtual” innovators-in- residence?’ I thought that was a genius idea, so we just tried it and took a chance. Luckily, we were able to set the stage and set the bar very high with our first innovator, Sarah Slobin. Game for anything and absolutely dedicated to the project, Sarah helped us develop the structure for our unique innovator-in-residence program. The way it works is we hire an outstanding media professional –- someone who is typically innovating within their own news organization –- to work with students and faculty on a project that can be completed in a single semester. This project is based on a problem the innovator is grappling with in his or her own newsroom connected to the intersection of story, technology and audience. The innovator is paired with an on-site professor, who can help shape the syllabus, make sure students show up for class, and troubleshoot in real time. The innovator teaches the class virtually a good deal of the time, using Google+ Hangouts, but they’re also expected to come to campus several times during key points in the project when it’s really helpful to have them on site. Typically, the innovator also utilizes their professional network to bring in guest speakers to address areas that they may be less familiar with, such as audience measurement or audio storytelling. The innovators are also supposed to share their experiences and lessons learned either through their personal blog, sites such as PBS MediaShift or within their own organizations. How do the innovators and students benefit? Reed: One huge benefit of the program is that students get to have an amazing real-world experience in which they learn relevant, marketable skills. It also teaches our faculty skills in new areas that they can apply to future classes. And it has laid the groundwork for new curriculum, including a new specialized master’s degree program. But what’s unique about our program is that over time we may also be contributing to changes in newsroom practice. Our program creates a creative space for professionals to work on projects or unique challenges without having to deal with the day-to-day pressures of the newsroom. For example, Sarah Slobin’s challenge was to determine the steps required to produce a compelling story for a mobile audience — rather than treating mobile as a secondary platform to print or the Web. Under Sarah’s direction, and with technical support, the students produced The Drug Next Door, a mobile-first reporting project that examines the abuse of study drugs on a college campus. Derek Willis hoped to find out whether using elections data at the hyper-local level could illuminate a larger story about changing patterns in voter behavior over time. The students learned how to access, analyze and visualize data, and they provided insights into trends that affected the outcome of the U.S. Senate election in West Virginia. Screen capture from “The Drug Next Door” mobile-first reporting project. What do Innovators-in-Residence do for journalism education that students may not get as much of in a traditional classroom setting? Reed: The innovators bring to the classroom high-level and highly relevant knowledge and experience. These are people actively working on real-world challenges, such as how to create unique content for specific platforms and devices, how to use data to drive storytelling and better inform audiences, and how to generate new sources of revenue and fundable opportunities. In working with the innovators, students are developing skills they will need in modern newsrooms. They’re not just learning technical skills, but they’re also learning how to problem solve, be creative, and iterate quickly. These are things that you don’t necessarily do in other classes because you’re learning basic skills. How do you navigate the best way to harness an innovator’s instruction? Reed: It’s important to establish expectations at the beginning — with the innovator, with the faculty member, and the students. Everybody has to know what’s at stake, and everybody has to buy into the concept. Then you have to create an open line of communication and allow some flexibility, because innovators are also working in their newsrooms. We had Derek Willis here during the midterm elections, which were huge, so we needed to work around his schedule. You also need to allow the innovator to work on a project that matches his or her area of expertise, and to provide the on-ground support and necessary tools to make the partnership and project a success. What kind of advice or guidelines do you give to Innovators in Residence when they come into the program? Reed: It is very helpful to assign an on-ground faculty member to work with the innovator as a teaching mentor and academic guide. Professionals may have unrealistic expectations about what students are capable of and what can be accomplished in a single semester. Students bring a lot of enthusiasm and passion to what they’re doing, but they need guidance, direction and feedback on a regular basis. In newsrooms, your work is either “good” or “bad,” but with students, you have to explain why the work is good or bad and what they need to do to improve. You have to tell students why what they’re doing is important and what the outcomes will be — pretty much at every stage of the process. 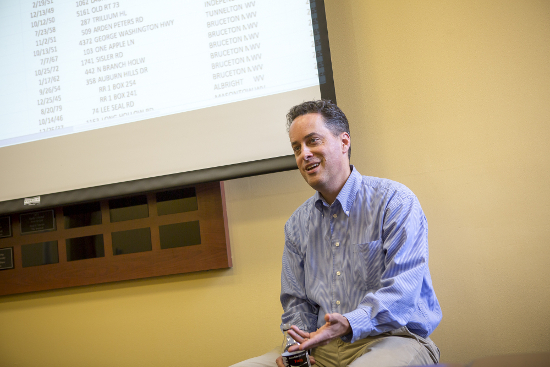 Derek Willis of the New York Times served as the WVU Innovator in Residence in fall 2014. Photo by David Smith. What are some first steps for programs that may be considering a similar Innovator-in-Residence program? Reed: One of the things we’re doing is applying for funding to expand our program and create a scalable model. But I can share some lessons we’ve learned so far from the first two projects. First you have to decide whether you want to do an actual in-person residency or a virtual residency, as we’ve done, and that may depend on your academic culture. Our college has a lot of experience with distance education, so for us teaching the class this way made a lot of sense. You also have to decide what the focus of your program will be, what kind of work you want your students to be doing, and perhaps what holes you want to fill in your curriculum. And then you’ve got to find the right media professionals with the skills you need and who are eager to lead real-world experiments with students. From our experience, the ideal innovator is someone with hands-on chops, who isn’t just directing other people to do the work. You also need faculty who are willing to engage in the project and who have an experimental mindset. Finally, you have to determine how this will fit into your curriculum, whether as a special topics class, an independent study, or through existing courses that can contribute to the project. What cautionary notes do you have for programs considering this initiative? Reed: A valuable lesson we learned is that you need to create some structure for students and some built-in deadlines — even if you have to make changes as you go along. Students need to have an idea of where the project is headed and to see short-term results, not just wait for the finished project. You also need to help students become comfortable with an environment that is changeable and constantly communicate to them that being able to adapt and switch gears is an important part of the learning process. 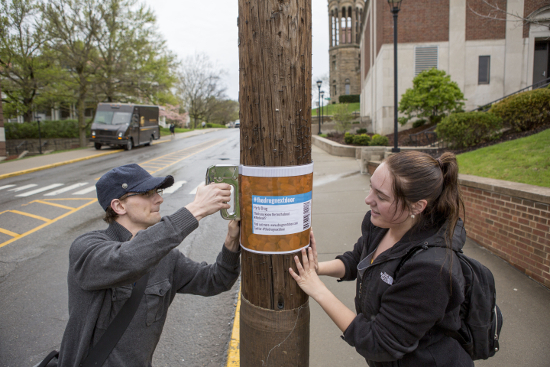 Tim Saar and Kristen Basham post fliers to promote the “The Drug Next Door” project. Photo by David Smith. In what ways does a project like this help professors and students adapt to the shifting media landscape going forward? Reed: It exposes students and faculty to what is happening in the industry right now and the kinds of skills that are in demand. It can also influence curriculum in ways that are significant. For example, while working on a project, you may realize that additional courses are needed in your curriculum to prepare students for this kind of work. There is also a certain amount of inspiration that comes from students being exposed to so many new possibilities. They’ve heard horror stories about how newspapers are dying and that there are no jobs. But when they meet people who are very successful — who are working precisely in the areas that the industry needs right now — they realize that the field is wide open to them. So, it generates hope and excitement, instead of fear and doubt. Ultimately the intangibles are what make this an invaluable program. 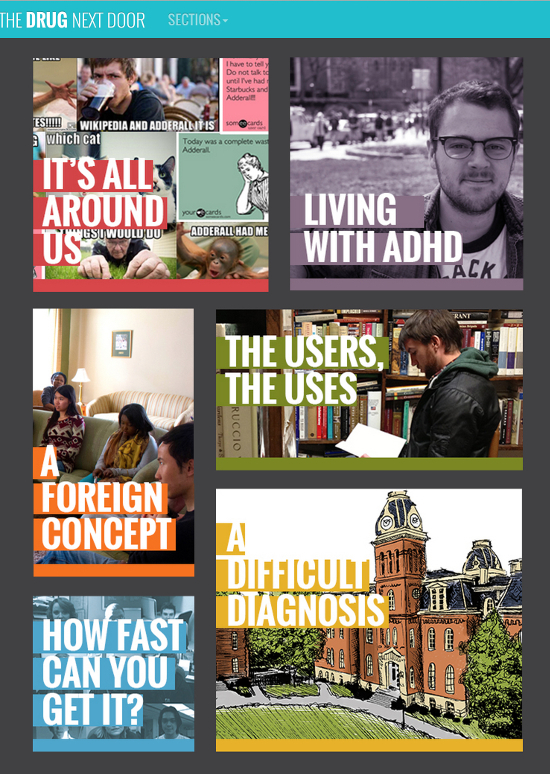 Read perspectives in EdShift’s Newsroom to Classroom series from WVU’s first two innovators in residence, Derek Willis and Sarah Slobin.